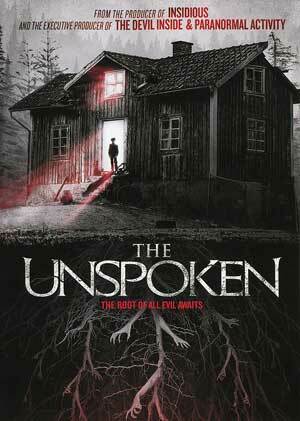 The Unspoken could’ve been a fine, if not ho-hum, supernatural horror flick but all of that is undone by a heavy-handed score and far too many jump scares that were far more annoying than actually scary. Plot Synopsis: In 1997 the close-knit Anderson family vanished from their home and no bodies were ever found. For years the house remained undisturbed… until now. When a mother (PASCALE HUTTON) and her troubled son (SUNNY SULJIC) move in, a local babysitter (JODELLE FERLAND) makes an unexpected connection with the boy, unlocking the dark secrets within the house. Quick Hit Review: The Unspoken actually had a half-decent plot and the performances from a who’s who of character actors weren’t bad including Jodelle Ferland serving as a satisfactory lead. However, all that was adequate was undone by numerous jump scares including the horror trope of a cat scrambling from some dark place (this happened twice!). While there were a few genuine scares, thanks to the jump cuts and music cues, it becomes just another lame supernatural horror movie destined to be forgotten if not already. The Unspoken spooks onto DVD presented with a 2.40 anamorphic widescreen aspect ratio and given a standard, but quite effective, Dolby Digital 5.1 track. English SDH and Spanish subtitles are also included. Overall, The Unspoken could’ve been a fine, if not ho-hum, supernatural horror flick but all of that is undone by a heavy-handed score and far too many jump scares that were far more annoying than actually scary. The DVD released by Anchor Bay is basic with no bonus features but the video/audio transfers were good.